Within the aerospace industry, it has become much more economical to repair costly engine components than to replace them. 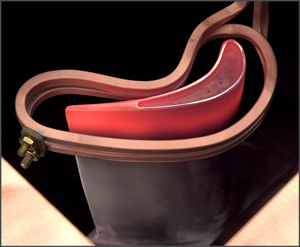 Our turnkey induction heating systems provide cost effective, time-saving solutions for repairing high pressure turbine (HPT) blade tips, Ti weld stress relief, brazing metering plates to dovetails and wear pads to mid-span spars, brazing honeycomb seals and other engine components, handling orphan parts and many other applications. Worn HTP blade tips can be repaired for reuse with a specialized welding process. Induction heating is a cost-effective way to bring the blade tip up to welding temperature (typically1800°F) in just minutes. The pre-heat and welding processes can be accomplished in an inert atmosphere with an Atmospheric Glove Box System provided the parts themselves are very clean. Purging Systems which circulate gas through the dovetail to eliminate contaminants are recommended for applications where the parts are not initially clean. While induction heating traditionally excels at selectively heating small areas with pinpoint accuracy, GH IA engineers have developed a compact induction heating vacuum furnace for whole part heat treating and brazing in a controlled atmosphere. This furnace provides an ideal environment for heating small lot sizes, parts of unusual shapes, and repairing "orphans" from other heating processes. Traditionally, these processes have been run in a large batch vacuum furnace. But with an increasing emphasis on continuous flow / lean manufacturing, many companies are looking for an alternative to these fossil-fuel furnaces and their drawbacks – the large footprint, lack of quality control and poor efficiency of vacuum furnaces fly in the face of lean, continuous flow manufacturing requirements. Because long "soak" times are required to bring batch vacuum furnaces up to temperature, they are generally left on 24/7 whether in actual use or not. Not exactly a lean proposition! In contrast to batch vacuum furnaces, these new induction vacuum furnaces deliver quick, clean heat for heat treating or brazing in a compact, cost-effective package. Individual parts can now be processed with speed, accuracy and consistency - right in your manufacturing cell! The desired brazing or heat treating temperature can be reached in minutes instead of hours. Induction heating can also be utilized for a wide variety of aerospace brazing process, such as brazing nickel metering plates to dovetails brazing wear pads to mid-span spars, brazing honeycomb seals and other components. To obtain maximum joint quality , these processes are done under stringent vacuum stringent vacuum (<5x10[-5] torr) and/or high temperature (up to 2200°F). 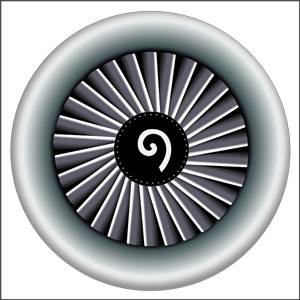 Induction heating can also be effectively utilized to quickly heat an inconel® susceptor for turbine engine fan blades. By using this indirect heating method, improved temperature uniformity across the blades can be achieved. In an atmosphere of argon, temperatures as high as 1950°F can be reached in less than 1 minute. Expensive aerospace components can be repaired with induction heating.